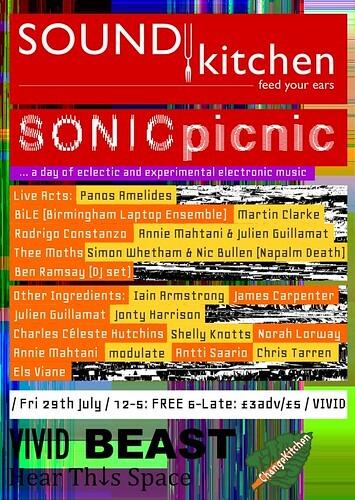 BiLE will be performing alongside a whole host of musicians at SONICpicnic on 29th July at VIVID in Birmingham, UK. You may remember that we had our very first performance at the first SOUNDkitchen event, so we’re really happy to be performing again. The Laptops Meet Musicians Festival selected BiLE for a performance in Venice. 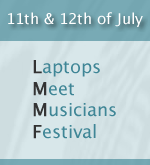 This is the first world festival of laptop orchestras and laptop ensembles. Laboratorioarazzi of the Giorgio Cini Foundation‘s “Istituto per la musica”, in collaboration with the Conservatory of Music “B. Marcello” and the “Ca’ Foscari” University (Venice, Italy) organizes two days of concerts, round tables, demos and posters about laptop orchestras and ensembles and interactivity between musicians and portable technologies taking place the 11th and 12th of July. We will be playing 2 pieces written by members of BiLE : XYZ by Shelly Knotts and Partially Percusive by Charles Celeste Hutchins. So if you happen to be in Venice, come along. Otherwise, we’ll be updating the blog when we get back! XYZ (or ‘Sonic Arm Wrestle’) is a structured improvisation using motion capture devices such as iPhone, Wiimote and Xbox Kinect. Each player can fight to take control of another players sound. In Partially Percusive, players sample the sounds of striking metallic objects and then manipulate the sounds in software. Players are instructed to listen for whether other players are playing sounds that are percussive vs sustained, pointillistic vs flowing, sparse vs dense, or loud vs soft and situate their own sounds accordingly. Players can sample a new sound after a pause and can pause for as long as they’d like, when they feel they should. You can hear a recording here. We will be playing a short set that will include Partially Percussive, a video of which you can view here. Confirm your attendance here on Facebook. The 2011 New Interfaces for Musical Expression selected BiLE to perform this year in Oslo. The NIME conference draws a varied group of participants, including researchers (musicology, computer science, interaction design, etc. ), artists (musicians, composers, dancers, etc.) and developers (self-employed and industrial). The common denominator is the mutual interest in groundbreaking technology and music, and contributions to the conference cover everything from research on human cognition through experimental technological devices to multimedia performances. We will be playing a new piece XYZ by BiLE member Shelly Knotts. The piece is a structured improvisation using motion capture devices such as iphones, wiimote and kinect, where each player can use their device to take over control of another players sound. So if you happen to be in Oslo, we’ll be performing on Tuesday 31st May @ 9.00pm at Chateau Neuf (Street address: Slemdalsveien 15). Otherwise, we’ll be updating the Blog when we get back! Thank you to all that came along and thanks to Reinhard Fuchs for inviting us there. BiLE are embarking on their first adventure outside of Birmingham on Sunday with our first gig in Liverpool! The performance will feature a selection of pieces by composers from BiLE: Julien Guillamat, Jorge Garcia Moncada and Charles Celeste Hutchins as well as our versions of network music classic Stuck Note by Scot Lancaster-Gresham of The Hub and Right Durations from Karlheinz Stockhausen’s collection of text pieces Aus den Sieben Tagen. We’re really looking forward to it and hope to see some new faces at the concert! 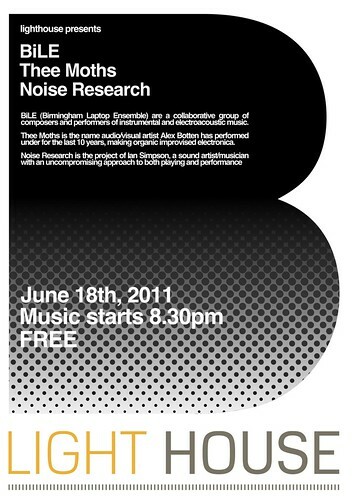 BiLE performed at We Are Birmingham last friday (29th April). We played new pieces by two of BiLE’s members, Charles Celeste Hutchins and Julien Guillamat as well as a cover of Stuck Note by Scot Lancaster-Gresham of The Hub.